WHAT ARE THE MAGIC COOKING SHEETS MADE OF? Magic Cooking sheets and Toaster Bags are made from a fluoropolymer plastic, encapsulating a fabric carcass. This product is FDA approved and has been used in commercial applications for more than 40 years. This type of material has been used by every McDonald's hamburger store, bread producers and numerous other commercial food producers since the early 1960's. The only things you can't do with your Magic product are put them directly on an element, on an open flame, use them as a cutting surface or fold them. You can use metal implements on them, but plastic is better. Magic products retain no odour, so you can cook fish, wipe your Magic sheet down then cook pancakes in the same spot. Customise any sheet with a pair of scissors. Wash in warm soapy water, you can put them in the dishwasher but you must ensure they don't wash onto the element. Commercially tested in baking application to over 2,500 times. It can go in any oven. Ideal for the hotplate of your BBQ but not over the open flame. Excellent for George Forman style health grills or sandwich makers. Super glue will not stick to the Magic sheet so they are great for crafts like model making. Use the Magic sheet to iron over transfers or if you have any delicate materials. Magic Toaster Bag is also good for Hash browns, fish fingers, chicken sticks etc. Easy for children to use. 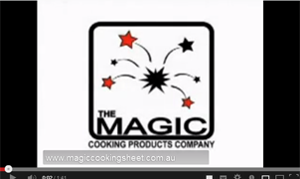 The Magic product is a composite Fluoro Polymer plastic combining two extremely high grade compounds coated and encapsulated around a fabric carcass resulting in a tough, economical, flexible cooking sheet.